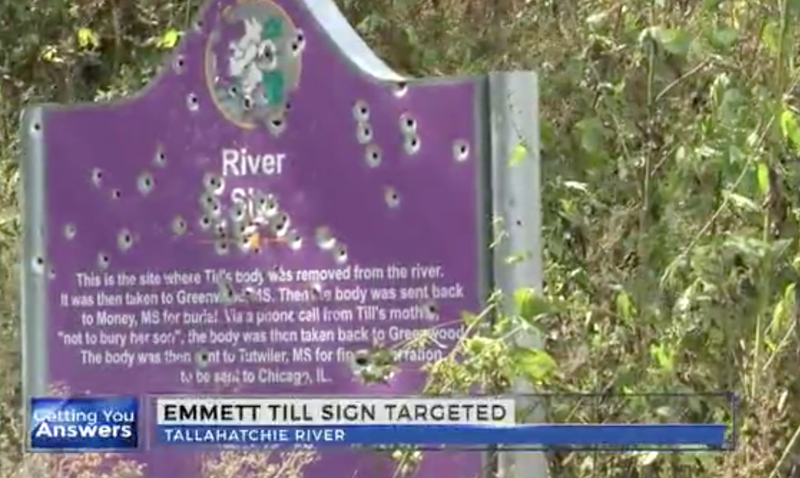 A sign marking the site where Emmett Till’s mutilated body was dredged from the Tallahatchie River in Mississippi more than fifty years ago, was found riddled with some 40 bullet holes last week. In 1955, Till, a 14-year-old African American boy from Chicago, was brutalized, shot in the head, and dumped in the river, allegedly for flirting with a white woman. Two white men were indicted for the murder, only to be acquitted later by an all-white jury. This is not the first time that signs commemorating Till’s death have been vandalized. In 2006, the Clarion-Ledger reports, vandals painted “KKK” on the Emmett Till Highway sign.